Keystone Mfg. Co., Boston, Massachussets, U.s.a. 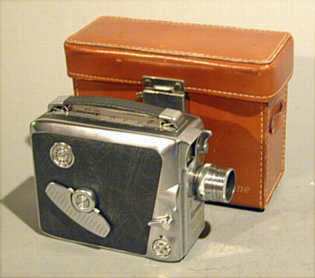 This movie camerta was produced in 1936. It is equipped with a lens Wollensak Velostigmat 1:1,9 12,5 mm. The machine weights kg. 0,750 and measures 42x160x95mm. The viewfinder is folding and is situated on the right side of the housing. The housing is brown metal. The machine is small and easy to handle. 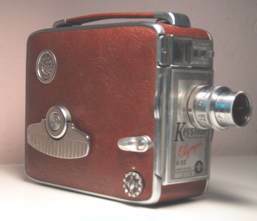 It is a movie camerta using a 8mm film, and was produced in 1956. It is equipped with a turret with three lenses:an Elgget 2x (22.5mm) f:1.8 telephoto, an Elgeet Wide Angle (7.5mm) f:1.8 and an Elgeet 11.5mm f:1.8. The machine weights kg. 1,150 and measures 65x105x175mm. The viewfinder is adjustable to permit the use of the three lenses. It is possibile set the view finder slide lever opposite the position corrisponding to the camera lens bein used. It is a rare machine. Produced in 1956, this movie camera is equipped with a lens Elgeet 12.5mm f:1.9. The housing is metal, with inserts in grey color leather. This machine used 8mm magazines. It weights kg. 0,880 and its measures are the followiing: 65x97x141mm. There is a slide lever to adjust the view finder: wide angle, normal and tele. 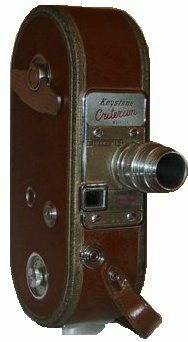 Produced in 1949, it is a 16mm movie camera equipped with a lens Keynstone Elgeet 25mm f:1.9. The housing is in brown metall. The camera is perfect. Its weight is kg. 2,000 and its measures are the following: 60x230x140mm. It is very big and heavy. It used 30 meters reels. Produced in 1936, it is a 16mm movie camera equipped with a lens Ilex Cinemat 25mm f:1.3,5. The housing is in black metall. The camera is perfect. Its weight is kg. 1,700 and its measures are the following: 57x226x146mm. It is very big and heavy. It used 30 meters reels. 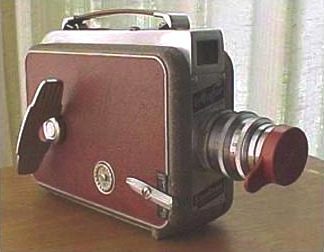 This movie camera was introduced on the market in 1950. It was equipped with an interchangeable lens Keystone Elgeet f:2,5 - 12,5mm. The machine has an adjustable viewfinder, for a normal, wide angle or tele lens. It weights kg. 0,800 and the measures are the following: 51x95x148. It is a compact, light and easy to handle movie camera. The ousing is metal, covered with brown leather. 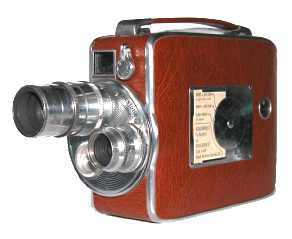 This movie camera was introduced on the market in 1949. It was equipped with two lenses interchangeable: a Cine Tel Elgeet f:3,5 38mm and a Wollensak Keystone f:2,5 13mm. It weights kg. 1,000 and the measures are the following: 51x95x148. It is a compact, light and easy to handle movie camera. The ousing is metal, covered with brown leather. There were two models: the normal K45 and the deluxe K45 Riviera. 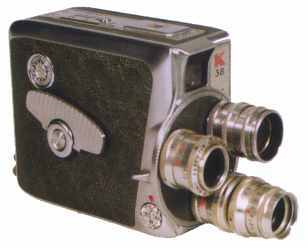 This movie camera was introduced on the market in 1950. 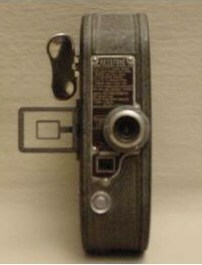 It was equipped with an interchangeable lens Wollensak Keystone f:1,8 - 24,5mm. The machine has an adjustable viewfinder, for a normal, wide angle or tele lens. It weights kg. 1,000 and the measures are the following: 55x120x175. It is a compact, light and easy to handle movie camera. The ousing is metal, covered with brown leather. 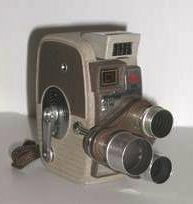 This movie camera was introduced on the market in 1958. It was equipped with a turret with three lenses: a Keystone Bausch&Lomb Telephoto f/2,3 25mm, a Keystone Bausch&Lomb f/2,3 9mm, a Keystone Bausch&Lomb f/2,3 12,7mm. It weights kg. 1,050 and the measures are the following: 52x122x145. 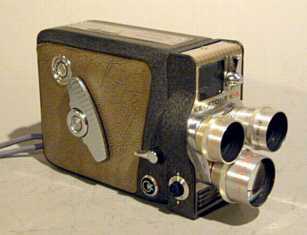 This movie camera was introduced on the market in 1956. It was equipped with a turret with three lenses: a Shneider Xenoplan 1:1,9/13mm, a Shneider Cinegon 1:1,9/6,5mm, and a Shneider Xenar 1:2,8/38mm. . It weights kg. 1,150 and the measures are the following: 65x105x175.